The Toyota is a true Legend and probably the most robust and sought after 4x4 in the market. We created this web site for fellow Hilux owners to learn more about their vehicles, meet like minded Hilux owners and most of all have fun. The Hilux Forum is to FREE to join, To join the forum click here . If you are already a member you can login on the login page. What you will find on the Forum? When you visit the forum you will note that in general this is a meeting place (a new way of life for some) where you can make friends, share stories and ideas and just have fun. Once you joined the forum and you land on the main page of the forum you will se various categories where discussions take place.Using these categories you can browse your way to the discussions. There are so many discussions that you can easily get lost. The best way to stay up to date is to look at the top left of the screen and look for the "active topics" link. That is the link that will show the latest active discussions. How to make your first post? Which Hilux is suitable for you? If you ever wondered which Hilux to choose you should read this article (click here) . What is good for one guy (or girl) is not necessarily good for the next guy. Some of us need a 4x4 to conquer adrenalin rushing obstacles and the next guy just need a comfortable and reliable Hilux to tour the country and every now and then cross a river. So there is no need that you get a robust, bumpy old Hilux if you nether going to use its abilities. The old solid front axle (SFA) Toyota Hilux is one of the best off-road vehicles ever built. 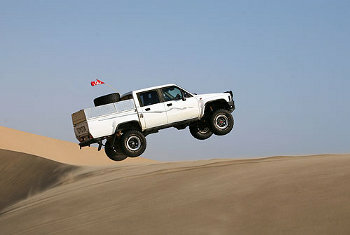 The Toyota Hilux is one of the most reliable and capable off-road vehicles around. It is reliable and robust and remain one of the top choices for the serious off-roader. On this web site you will find more information about the Toyota Hilux. This web site is not only about the old SFA Hilux or 4x4 Hiluxes but about all Hilux models. In South Africa Toyota stopped production of the SFA Hiluxes more than twenty years ago and still they are well sought after. If you can find one in a good condition, you will pay much more than the current quoted book value for it. The Hilux is most probably the best buy for your money. We would like to thank the following companies for their support, these are the guys who contribute towards the costs of keeping this web site free to all. In other countries the Toyota Hilux is also known as the Toyota Tacoma.